This morning along with my ward colleague Councillor Fraser Macpherson I took part in a Litter Pick which started on Dundee University campus then went along the Perth Road and finally down Seabraes and along to the Marketgait. This litter pick was in association with the Bonnie Dundee group who are mostly volunteers who work hard every year to help Dundee enter the Bonnie Scotland events. It was good to see a company like Scottish and Southern Energy 'volunteer' a couple of workers to help as well. 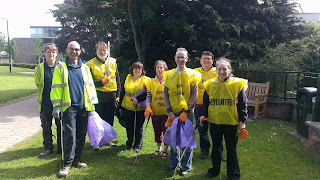 The event was also part of Dundee's Festival of Volunteering. It is important to pay tribute to the work of volunteers, they really do make a difference to our society. They save the public purse a fortune and sometimes I feel this is not acknowledged enough. Politicians should be looking for ways to make it easy for people to volunteer and we should be supporting the work of the many many organisations across the city which rely on volunteers. In terms of the litter pick it was a lovely day to be out in the West End but it really did beg the questions -why don't smokers put their cigarette butts in the bin? Tonight I attended the June meeting of the Community Spirit Action Group. There was a very interesting presentation from two students from the Dundee University Law Clinic. This clinic can offer help with legal issues, the work is carried out free by law students for the university, under supervision from a qualified lawyer. This is a great initiative which offers help to people who might not otherwise be able to get legal redress. I raised the future of domestic waste collections in the city and highlighted this as an area that Community Spirit will want to have an input into. In much of the area covered by Community Spirit the dominant housing type is flats. If the council is going to move towards fortnightly bin collections then it must come up with a plan to improve recycling in flatted areas. I was pleased to see how interested in this topic the members of Community Spirit were. I hope that Community Spirit will take part in the consultation which will happen soon. I hope that people right across the city will also take part in this important consultation which must be open, transparent and robust. 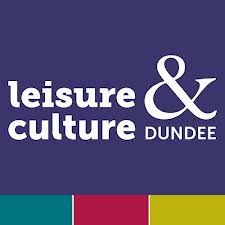 Today I attended a board meeting of Leisure & Culture Dundee. One of the first things that we did was to congratulate the library service for winning the UK Library of the Year award. It was good to get the chance to listen to the exciting plans for the new Olympia. It was also good to hear that Lochee Swimming Pool has re-opened after works which were going on there. I asked a number of questions about the refurbishment of Blackness Library which is on-going at the moment. This morning I attended the second Dundee Economic Summit. I was pleased to be there because it is important that everyone with the best interests of the city at heart work together to promote the economy of the city, especially jobs. The event today was well attended and it was good to meet a number of people who are working together to promote the economy of the city. There was an excellent contribution from Herman Twickler, the Managing Director of PressureFab Group which is based within my ward. He made a very strong case for more modern apprenticeships and especially made the case for manufacturing. Mr Twickler also commented upon the uncertainty in the run-up to the independence referendum. My view is that it is important that we get to the point where we are talking about what is important to people, on issues like jobs rather than on constitutional discussion. I was pleased to see the launch of the Discover Opportunities Employer Pledge today. This is about maximising the life chances of our young people and adults, supporting business growth and developing Dundee's economy. The City Council's Director of City Development Mike Galloway gave an update on the exciting plans for Dundee's Waterfront. Professor Beatriz Plaza from the University of the Basque Country gave an excellent presentation on the experience of Bilbao after the coming of the Guggenheim Museum. This was very interesting and offered a lot of food for thought for the city once the V & A comes to Dundee. There was also an interesting presentation on the cultural regeneration of Gateshead and Newcastle and its economic impact. I thought that the summit was very interesting and it was good to hear about a lot of the work which is going on. It clearly makes the point that we all have to work together to promote the city and its economy. Jobs have been and remain my number one priority and it is important that we work together to bring jobs to our city. I am looking for action on this now. Today saw a couple of anniversaries commented upon. The Queen celebrated the 60th anniversary of her Coronation and it is fair to comment on her commitment to service. 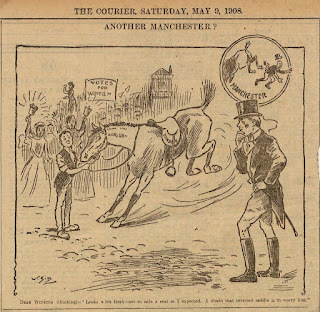 There is another anniversary which was marked today, one hundred years ago today Emily Wilding Davison was fatally injured as she tried to pin the suffragettes colours to the King's horse at the Derby. Davison's place in history is not without controversy, did her actions speed up or hinder the cause of votes for women? What is remarkable though is to consider that one hundred years ago from today no women had the vote in this country. Women only received the vote, on a different franchise, in 1918 and only received the vote on the same basis as men in 1928. It just seems ridiculous that people ever tried to suggest that women should not have the vote. In Dundee there was a very strong suffragette movement. The fact that Winston Churchill stood in the 1908 by-election and subsequently represented Dundee until 1922 attracted a lot of suffragette attention. 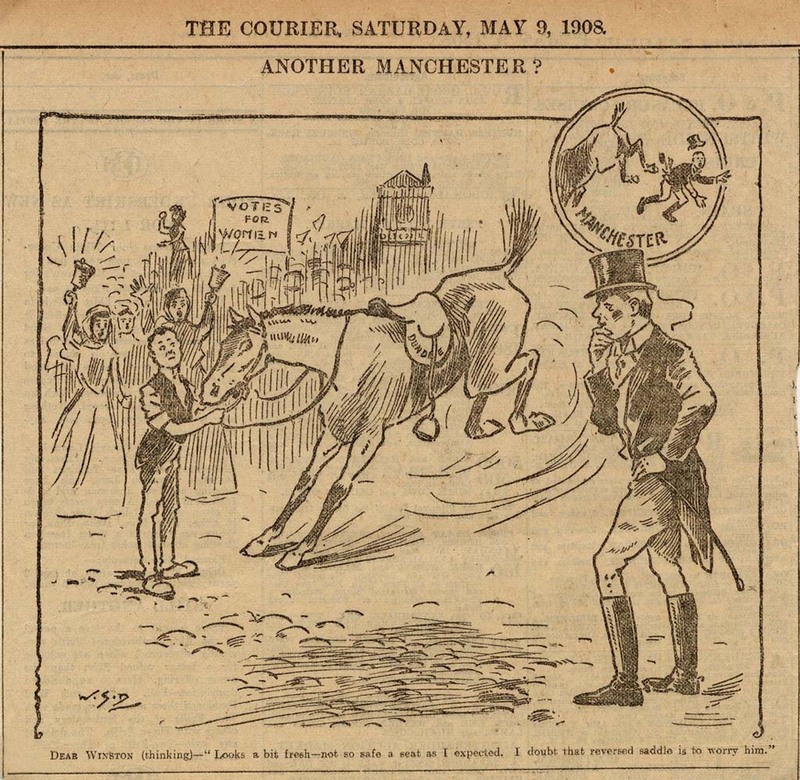 Indeed as the cartoon here suggests there was a belief that the suffragettes had helped to unseat Churchill in Manchester and that they might do it again in Dundee. There is an excellent resource on the suffragettes in Dundee from Leisure and Culture Dundee from their previous exhibition on this issue. The equally excellent Dundee Women's Trail commemorates a number of suffragettes and is well worth looking at. I was pleased last year when after the election to the City Council Labour increased women's representation in our group to 40%. It is important that such efforts to promote equality are continued. I read today that since 1918 there have only been 369 female MPs and in the current House of Commons there are 503 male MPs which is a remarkable statistic. This anniversary shows how much we have moved on in the last 100 years but also that there is much more to do. Equality in all its forms is important, especially economic equality, and is in my view this is what is important and changing flags will contribute little or nothing to that battle for equality. 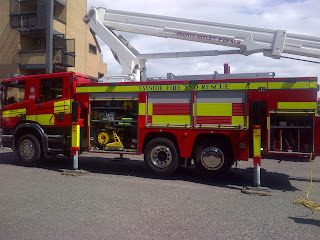 Along with a number of colleagues from the City Council I visited Macalpine Road Fire Station today to receive a briefing on the work of the Scottish Fire and Rescue Service in Dundee. 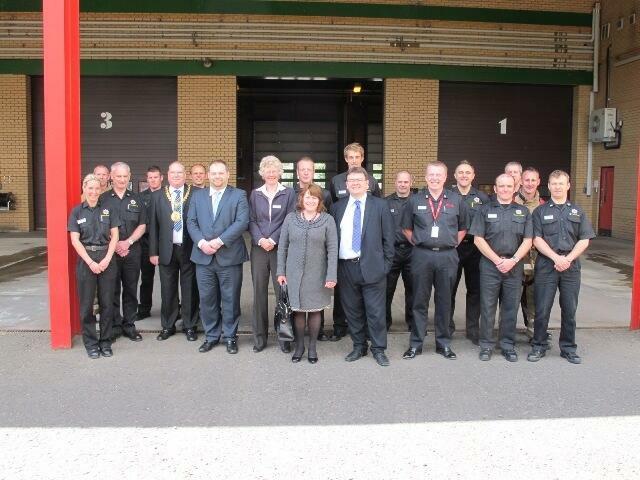 It was good to meet officers and firefighters who are working hard to protect our safety. It was good to have a chance to discuss the fire and rescue service and how we will provide local scrutiny for the service. Since we now have a national fire and rescue service it is incredibly important that we ensure that local accountability is still developed. This service cannot be allowed to become remote from the needs of local people. I will continue to work to ensure that the Scottish Fire and Rescue Service is aware of the views of local elected representatives. 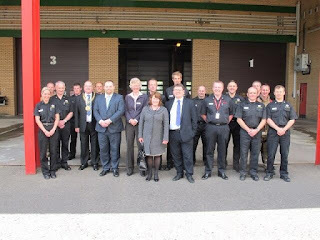 I will also try and ensure that I am aware of the views of local people on the fire service. It was a good opportunity to learn more about the fire and rescue service. 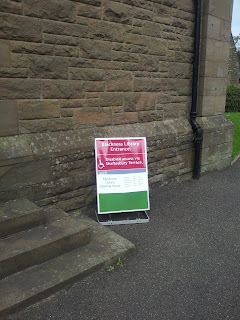 I was pleased to visit the new temporary home of Blackness Library at Logie & St John's (Cross) Church on Blackness Road. Blackness Library is currently being upgraded and will be closed for around six or eight weeks. I hope that the improved access at Blackness Library will make it more accessible to the public and make it even more of a hub of activity for people in the West End. 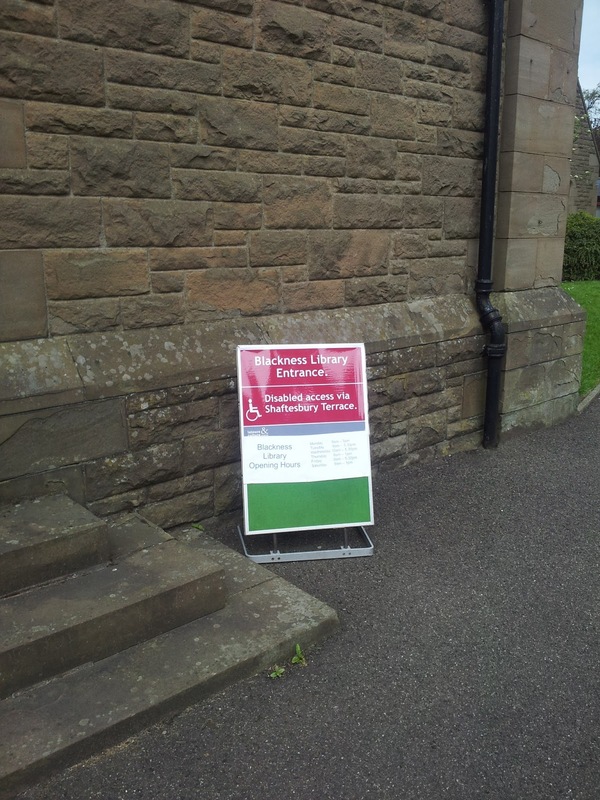 For the next few weeks there will be a limited service provided at Logie & St John's (Cross) Church. It is good that a service is being provided, I would like to thank those who have helped this to happen. It is worth pointing out that library members can use services at all Dundee libraries. I hope that this disruption will be worth it when Blackness Library re-opens later in the summer. Over the weekend Dundee City Council published the salary and expenses returns for all elected members you can look at them here. As you will see in the past year I have claimed the nationally agreed salary for councillors £16,233.96. I have also used a mobile phone provided by the council which cost £154.66 in the past year. This bill was paid by the council. I am happy to answer any questions from constituents on my expenses. As part of the agreement which came in prior to my election in 2007 the council is also called upon to publish details of the training which councillors undertake, the information is here, I have attended most of these training sessions.